OVERNIGHT TALKS BETWEEN the HSE and the Irish Nurses and Midwives’ Organisation have led to the acceptance of revised proposals by the union’s national executive. This means that Thursday’s strike action will now not go ahead. The proposals centre around procedures for sufficiently dealing with overcrowding and will see greater consultation between the HSE and representatives for nurses. They include weekly meetings between INMO representatives and management to monitor overcrowding and enhanced health and safety measures. Speaking on RTÉ’s Morning Ireland programme this morning the director general of the Workplace Relations Commission, Kieran Mulvey, said: “Effectively I think we’ve put in place… the confidence building measures that the INMO places particular emphasis on in terms of the original rejection. Not necessarily of the proposals but the fact that they would be implemented. I think that we’ve strengthened that now by putting structures which can be monitored, reviewed and evaluated. Two-hour work stoppages had been due to take place in seven emergency departments around the country on Thursday. In a statement, INMO general secretary Liam Doran said the revised proposals “confirm that the concerns of our members, in rejecting the earlier measures, were centred on patient safety, reducing risk and ensuring implementation of the measures necessary to reduce ED overcrowding”. “It is now imperative that the HSE, at national level, and at senior level within all Hospital Groups, immediately commits to fully operate the revised proposals. This now involves meeting with our members, on a weekly basis, demonstrating that their priority is reducing overcrowding and ensuring nurses can practice safely within a manageable working environment”. 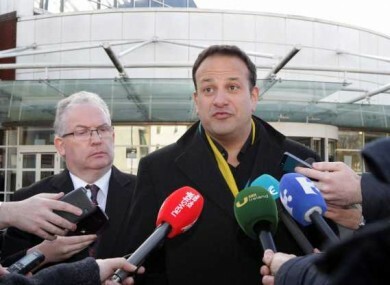 Minister for Health Leo Varadkar welcomed the decision by the executive to accept the proposals. Members will now be balloted on proposals, but the executive has recommended they be accepted. “The interests of patients are always best served through negotiation and by avoiding industrial action. I particularly welcome the fact that the proposals contain specific measures to enhance patient safety and delivery of care,” Varadkar said. I hope that ED nurses will regard the proposals as sufficiently detailed and robust to address their concerns around activation of the escalation policy, health and safety concerns and implementation of the agreement itself. The minister also said he expected that “a deeper level of trust” would develop between hospital management and nursing staff through the implementation and monitoring of the proposals. Email “Thursday's strike action by nurses has been called off”. Feedback on “Thursday's strike action by nurses has been called off”.